Near a cottage in south central ontario canada. This is literally 12 inches from my head as I enter my home. It is easily 2.5 inches leg to leg. White waxy back with a vertical stripe. Brown striped hairy legs. Should I move? Hi. your spider is one of the orb weavers, Araneidae family, possibly Larinioides genus, furrow spiders. They are all quite harmless. 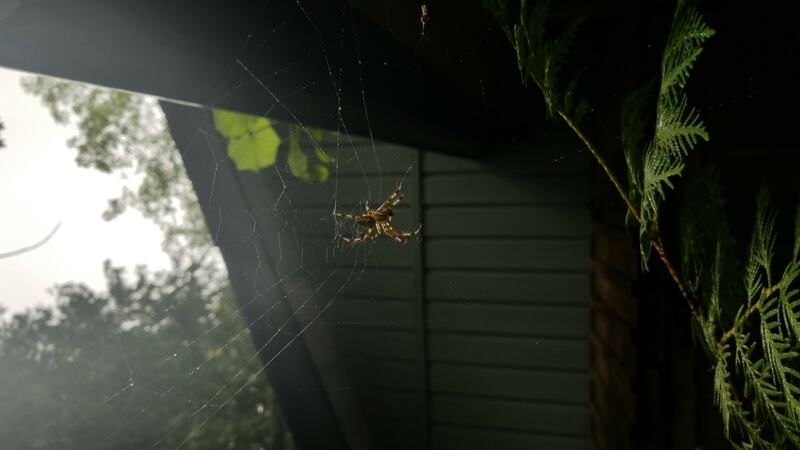 Having played with these as a kid, if they web my porch in an inconvenience, I just take them out of their web and try to get them to make home near a window out of the way. Nothing like a face full of spider coming in late at night. I welcome them and leave them undisturbed out of the way. Hardly call to move,easier getting the spider to move.